Encourage Capital - A new kind of investment firm that seeks to make profitable investments that solve critical social and environmental issues. Encourage Capital is a new kind of investment firm that seeks to change the way investment capital is used to solve critical environmental and social problems. We are building a community of investors, foundations, market-leading companies and non-profits to deploy private capital into systemic solutions to the world's most pressing challenges. We believe we can generate both compelling investment returns and social and environmental impacts for our investors. The core of our business model is the development and deployment of Solutions Strategies. The development of a Solutions Strategy starts with the identification of a social or environmental issue, followed by a systemic analysis of that issue. We then develop cost-effective, impactful and systemic strategies that will catalyze innovative, replicable, and scalable investments for commercial capital while identifying opportunities for multi-stakeholder collaboration. 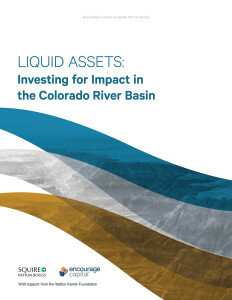 In October of 2015 Encourage, working with its partners at Culp and Kelly LLC and The Walton Foundation, produced a groundbreaking report entitled Liquid Assets: Investing for Impact in the Colorado River Basin. Since then, we have been working with Culp & Kelly LLC and Trout Unlimited to take some of the recommendations of this report and make them real on the ground. This report summarizes some of the lessons learned and findings of that work. It details some of the twists, turns, and pivots that are needed when trying to turn theory into practice. Encourage Capital, LLC was formed in December 2014 through the combination of Wolfensohn Fund Management, LP and EKO Asset Management Partners, LLC. Together these firms represent a formidable base of knowledge, investment track record, conviction, relationships, passion and vision that is scaling up impact investing to deploy private capital to address some of the most pressing social and environmental challenges of our time. © Copyright 2017 Encourage Capital. Encourage Capital is a service mark of Encourage Capital, LLC.